This 911’s finish is meticulously completed by hand in the company’s new workshop called Porsche Exclusive Manufaktur. Among other things, we notice the sport seats covered in two layers of perforated leather, highlighted with two gold strips as well as gold-coloured stitching and Turbo S embroideries, and an Alcantara roofliner trimmed with twin gold strips, of course. 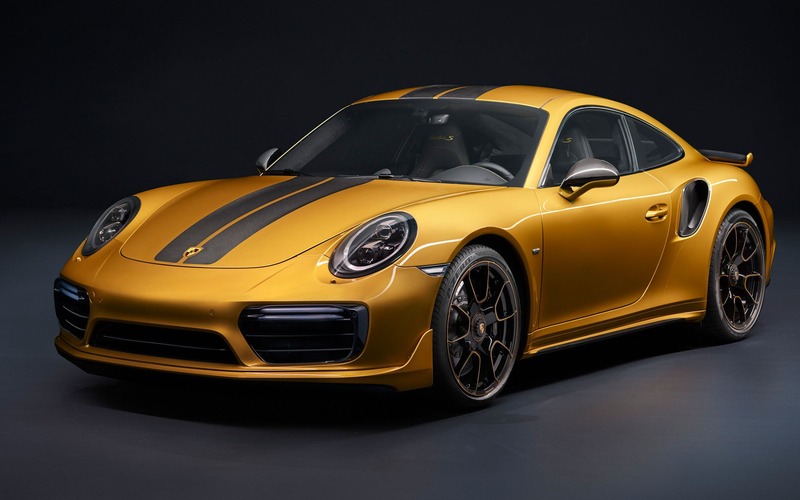 A metallic yellow gold paint job dresses up the Porsche 911 Turbo S Exclusive Series, enhanced with various carbon elements such as on the hood, the roof and the side skirts. At the rear, there’s a Turbo Aero wing and dual stainless black exhaust outlets. The car is equipped with a twin-turbocharged, 3.8-litre flat-six engine that belts out 553 pound-feet of torque which helps achieve a 0-100 km/h time of 2.9 seconds, and 200 km/h in 9.6 seconds. The entry price for the Porsche 911 Turbo S Exclusive Series in Canada is $293,800, and it’s scheduled to arrive in dealerships during the fourth quarter of 2017.